• Get ready for Progressive KBtribechat chat Jan. 10th! The countdown to KBIS 2017 is on and once again we’ll be hosting an exciting progressive KBtribechat right from the show floor! Join the KBIS 2017 team on January 10th at 2:00pm to chat about everything from technology-driven style to exciting hardware finishes and water-saving design! We have some new faces joining us this year. We know you won’t want to miss hearing from Signature Kitchen Suite, Emtek Assa-Abloy and TOTO! The chat will get started at 2:00 pm on the dot in the Signature Kitchen Suite booth (#W309), move along to the Emtek booth at 2:20 pm (W1311) and finish at the TOTO booth at 2:40 pm (W1329). For those of you who can’t join in person, make sure you’re following the hashtags #KBtribechat and #KBIS2017 on Twitter and Instagram. See you there, tribe! Q1: How does technology help YOU in the kitchen? Cleaning? Cooking guidance? What’s your priority? Q2: How do think tech integration with kitchen appliances is impacting consumer choices? Is there a new level in luxury? LIVE TWEETERS: Snap your favorite @SKSHome products now & share! Feel free to post to Instagram as well! Q3: Brass has seen a hike in popularity. What are some surprising ways you’ve seen this metal make a comeback? Q4: Split styles/ finishes are becoming more popular. How important to you is the ability to mix & match hardware? LIVE TWEETERS: Snap your favorite @Emtek_assaabloy products now! Share on Instagram too! Q5: More than function, the plumbing category has seen a burst of sophistication. How is style changing products? Q6. Water conservation is top of mind in bath fixture design. Has this shift impacted which products you specify? LIVE TWEETERS: Snap your favorite @TOTOUSA product now & share! We have a group Pinterest board for Progressive KBtribechat sharing. Let us know if you’d like to be included. Special thanks to our 2017 Progressive KBtribechat sponsors: @SKSHome, @Emtek_assaabloy, and @TOTOUSA! In just a few short days, the world of kitchen + bath will descend upon Vegas for #KBIS2016 and #DCW2016! With over 500 brands and THOUSANDS of products being represented at this year’s KBIS, it will be one for the record books! KBIS Attendees – don’t forget to join the #KBTRIBECHAT gang and the @KBIS2016 social team live on the show floor at 1:00pm PST for a special edition Progressive #KBtribechat! Thanks to our sponsors @CambriaQuartz, @WellbornCabinet and @TOTOUSA! We can’t wait to see the new and exciting designs from each of these great brands. And good news…all three brands are so close together that we get more time in each of their booths. TUESDAY, JANUARY 19 AT 1:00 PM PST. If you’re not with us in Vegas, remember to follow the chat live (Vegas time!) using hashtags #KBtribechat and #KBIS2016. We have a group Pinterest Board for Progressive KBtribechat sharing. Let us know if you’d like to pin with us! 1. Consumers crave details & intricacy in more than just the countertop. Where else could you use @CambriaQuartz products? 2. Nature is often cited as design inspiration. Share OTHER sources of inspiration in design. @CambriaQuartz will share too! LIVE TWEETERS: Snap your favorite @CambriaQuartz product & share! 3. Porcelain is @WellbornCabinet’s new white. Why is white such an emerging color trend for 2016? 4. With @WellbornCabinet, you draw it, they build it. Share unique custom cabinetry solutions you’d like to see in the home. LIVE TWEETERS: Snap your favorite @WellbornCabinet product & share! 5. @TOTOUSA asks: How does technology help YOU in the bathroom? Water conservation? Cleaning tech? What’s your priority? 6. What do you think is next big international bathroom trend to hit North America? And see what’s coming soon from @TOTOUSA! LIVE TWEETERS: Snap your favorite @TOTOUSA product & share! We are starting our Dwell on Design Progressive KBtribechat in the TOTO booth (#1446). Question 1: Contemporary looks don’t stay that way for long. How can you give your bathroom a modern look without it becoming dated in the future? Question 2: With the drought in CA, water-efficiency is a priority. What are ways you can reduce your water use without sacrificing a luxury bathroom experience? Question 3: How can you achieve socially sustainable designs in the bathroom and avoid the drab “institutional” look? Question 4: Tiny homes are trending. What are ways you can save space in the bathroom without giving up style or functionality? At 11:28 we will be walking over to the Miele USA booth (#1347). Balance requires flawless symmetry…in form, function and fit. Miele’s Generation 6000 dishwashers are a natural extension of the culinary appliances, aligning perfectly in terms of design, functionality, and user interface. Dare to cook and clean differently when pairing the Miele Range with the new Miele Generation 6000 dishwasher series and be amazed by the results. We are excited to host the progressive KBTribeChat at our booth (#1347) during this year’s DwellonDesign tradeshow. Please join us at 11:32 am PST on Friday, May 29th. 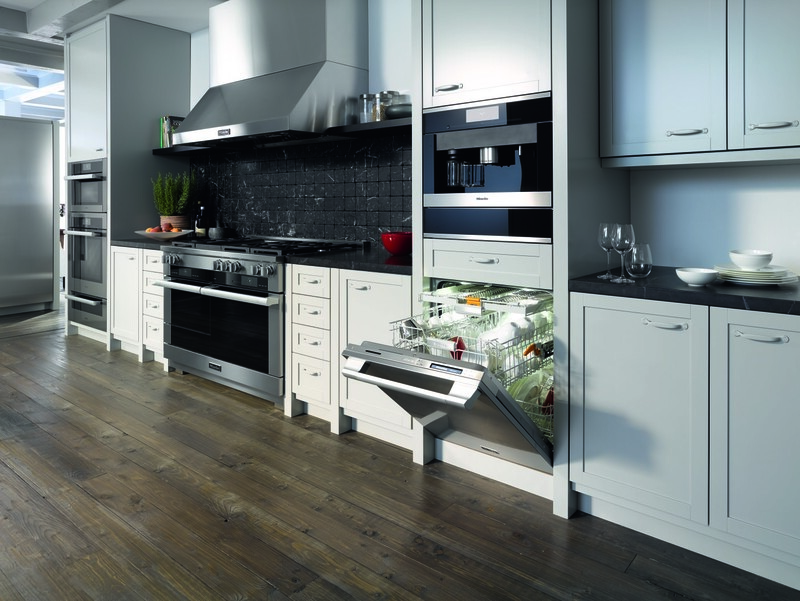 Question 2: Miele’s solution to a handless kitchen is a dishwasher that can open by knocking. How would the #K20 balance your or your clients’ kitchen? Question 3: #G6000dishwashers have a consistent look with #TheMieleRange and Range Hoods. Can you identify elements of the harmonious design? Question 4: We just made bread in #TheMieleRange using Moisture Plus, Having tasted the bread, describe how Moisture Plus affects the taste and texture. 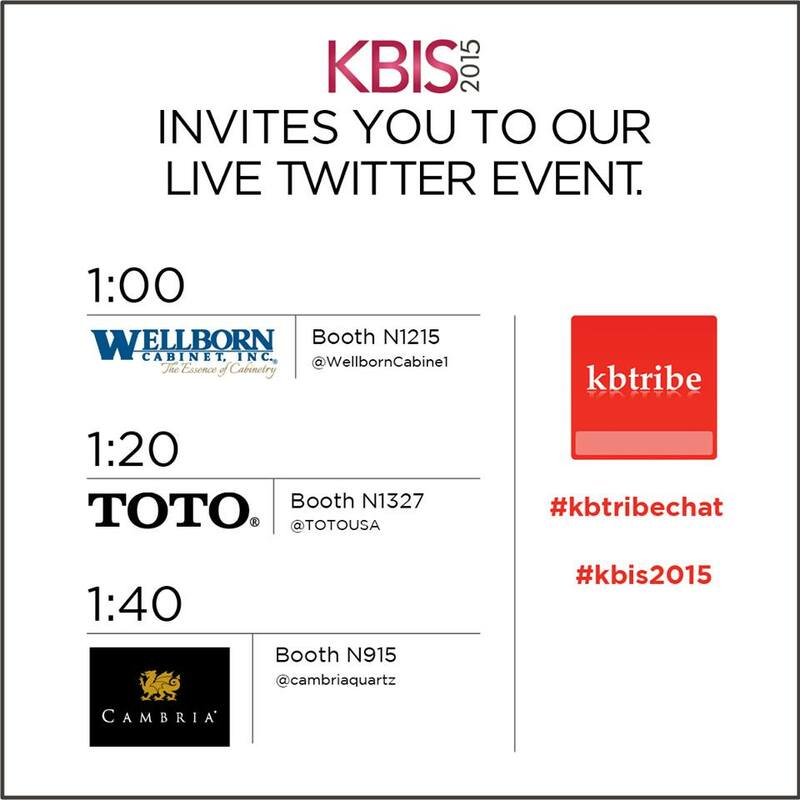 Join us for our 2nd annual Progressive #KBTRIBECHAT on the KBIS show floor! As we make our way around the floor in this fun hour from 1:00 – 2:00 pm PT on Tuesday, January 20th, be prepared to be inspired by the industry innovation in our three sponsor booths. Big thanks to Wellborn Cabinetry, TOTO USA and Cambria Quartz. For those following along with us on Twitter, watch for our “snap a fave product” feature from all the live tweeters. We’ll be making a Pinterest board after the show for all of the live action shots.